Chris Crooks' kinetic steel spiral celebrates unions that are written in the stars. The latest research has found that an invisible force scientists are calling "love" (not gravity) actually holds the universe together. Hang Chris Crooks' kinetic sculpture on a porch or patio (it's sealed for outdoor use) where the slightest breeze will make it twirl with a hypnotic, spiraling motion. 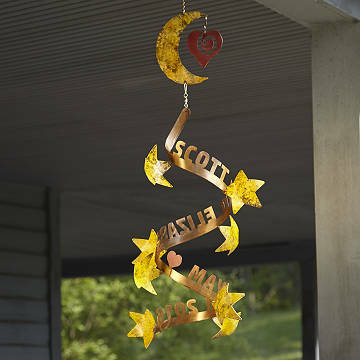 Personalized with a couple's names and wedding or anniversary date, it celebrates a union written in the stars—one that keeps them revolving together for years to come. Chris cuts (with a plasma cutter... how far out is that?) shapes and paints sheets of steel into a banner that also includes an array of stars, hearts, and a crescent moon. These elements align in a playful tribute to the celestial forces that bring couples into each other's orbit. It makes a creative wedding or anniversary gift for any pair of starstruck lovers. Handmade in Tucson, Arizona. The stars are bent perfectly so any slight breeze spins it nicely. The mobile was impressive. So attractive & the fact that it is personalized perfectly makes it even more special. Very personalized gift. I love that it was made in America! I have all of our sibling names and as they rotate in the breeze reminding me have a happy childhood times. Lovely bereavement gift. Love the patina on this sculpture! The sculpture is beautiful, so well done! Loved it! I would absolutely purchase this! Decorative, commemorating may years together. she will be putting it in her garden in her new home.